Have you found yourself wishing that your Android’s battery would last longer? Don’t answer that, I already know. Be it poor app design, ever-larger display sizes, or our constant desire to play mobile games, we’re eating up battery life faster than we’d like. As a platform, Android has improved with each iteration and task management, and multitasking keeps getting smarter. With that said, one of the first complaints from new smartphone users is that the battery doesn’t seem to live up to expectations. Sure, the 2013 crop of flagship phones seems promising, but not everyone wants a Samsung Galaxy S4 or an HTC One. What’s more, not everyone wants to go to Verizon for a Motorola Droid Razr Maxx HD. Thankfully, Android developers have been looking for ways to improve the life of a smartphone’s battery. The early days of Android saw the rise of task killers and app managers that would shut down apps and free up memory. Over time, however, Android would become more efficient and handle the processes at a platform level. Many handsets now have custom touches built in that will adjust settings based on remaining battery life in an effort to squeeze out just a few more minutes. Unfortunately, things are still far from perfect. I have spent time exploring a number of battery apps over the years, and I have become quite fond of some of them. Here’s a list of five of my favorite apps for prolonging the life of your Android’s battery. To be clear, there are a few settings that will be found on more than one app. Keeping that in mind, I tried to highlight some of the better options for each title. 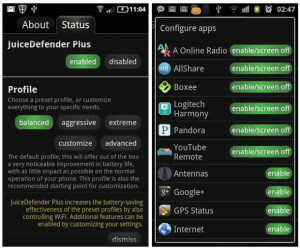 Packed with seemingly endless options, Juice Defender is perhaps my favorite app on this list. The free client lets you manage common connections, such as mobile data as well as Wi-Fi and Bluetooth. Multiple preset modes, like “aggressive” and “balanced,” allow for toggling and scheduling, background synchronization, and choosing which apps can keep your screen on. Aside from the free app, Juice Defender also comes in Plus ($1.99) and Ultimate ($4.99) versions. Depending on what level of control you are looking for, one might be better suited for your needs. The Plus version, for instance, adds “extreme” and “customized” profiles as well as location-aware Wi-Fi, as well as scheduling for night hours. The Ultimate app also boasts peak hours and weekend settings, autosync, and deeper GPS controls. Indeed, I definitely recommend the free client as a starting point, but have no qualms about endorsing the paid apps. Standout features: Multiple versions to suit needs; user profiles; scheduling; and location-aware features. 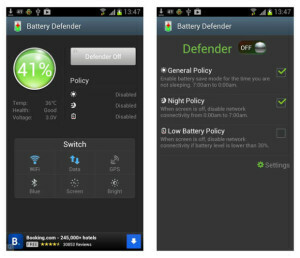 One of the more feature-rich free clients I’ve encountered, Battery Defender offers plenty of options at no cost. It might sound trivial, but I like having the exact battery percentage listed in my notification bar. Far more accurate than what the stock experience usually gives you, it’s a simple pleasure. Battery Defender provides quick and painless access to toggling your common connections such as GPS, Wi-Fi, mobile data, and Bluetooth. I like being able to hop in and turn off the stuff I’m not using — every little bit helps. While this sort of thing is built into many of today’s top Android phones, older or less popular models aren’t so fortunate. Another feature that users will appreciate is Genius Scan, which allows sync to occur every 15 minutes. The adjustable “quiet sleeping” option disables Wi-Fi and data connections at night, a helpful feature for those who do not sleep next to their phones. Standout features: Easy connections toggling; sleeping mode; staggered sync; and battery percentage in notification bar. Designed by the Go Dev Team, this one is as gorgeous as it is flexible. A simple tap of the screen lets you toggle preset modes, making it easy to go from reading and relaxing to online gaming. For those who don’t like the standard modes, there are two other slots available for creating custom experiences. 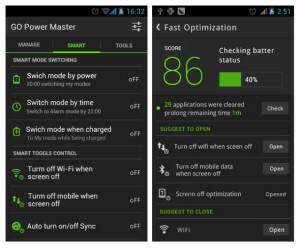 Go Power Master Battery Saver keeps an eye on your apps to determine which are eating up battery more than others. By assigning a score to your battery, the app is able to determine which features you can enable or disable to extend the life. Tapping the optimize button, in essence, cleans everything up and tacks on some extra expected life. Doing this alone can provide an extra hour or more. While the free app is stocked with options and settings, the premium pack brings about another dozen features. Available through in-app purchase for $4.99, this upgraded bundle removes ads and tosses in scheduled settings, more control over Wi-Fi, Bluetooth, and CPU, and a third “extreme” mode. The app provides quick access to a number of settings with two home screen widgets. Should you go with the premium option, there are three more widgets to choose from. A number of skins or themes are available for Go Dev’s own widgets, and you can also adjust how items appear in the notification bar. Standout features: Handy widgets; multiple user modes; very clean interface; a steady stream of development updates. Perhaps the most “risky” app on this list, Autorun Manager lets you determine which apps start running when your phone boots up. Like the aforementioned apps, this one comes in two modes: basic and advanced. Apps selected in basic mode are terminated immediately when the phone boots, though some will pop back up and start running. My advice here is to leave those alone and let system settings take over. As for the advanced mode, you will find more control over things such as widgets and receivers, and system-wide actions. The free version of Autorun Manager is supported by ads, but you can purchase a Pro key for $3.99. Doing so will also keeps apps from autorestarting in basic mode, as well as block more than 10 receivers in advanced mode. Just for good measure, you also get “Chuck Norris mode,” which lets you kill apps in a more aggressive manner. Please note that if you are on the fence over this app, err on the side of judgment and pass. For those of you who demand more control and a have firm grasp on Android’s core functions, however, this might be right up your alley. Standout features: Stops pesky apps from starting up; two user modes; clear insight into what runs immediately at bootup; awesome Chuck Norris reference. Of all the apps listed here, Tasker is the one that provides more than just battery extension and task-killing. In fact, I would recommend this one to anyone who wants to help automate the Android experience. In the area of battery life, I like Tasker; it allows me to set times for sleeping and disabling of connections. While I generally tend to plug my phone in overnight, Tasker has proven handy in cases where I do not. Besides time of day, other triggers include day and location; both are useful for people with set work schedules. I also appreciate the way Tasker lets me set my phone to handle media, texting, phone calls, and other Android functions. It might take a while to fully grasp the capabilities, but at $2.99 this one is a true set-it-and-forget-it app.